The priciest Manhattan home to hit the market this week is an 8,000-square-foot condominium unit at 25 Columbus Circle, according to Streeteasy.com. The eight-bedroom, 12-bath home has a listing price of $57.5 million and is being marketed by Brown Harris Stevens’ Elizabeth Sample and Brenda Powers. The second most expensive home to come online this week is also at 25 Columbus Circle. The five-bedroom, six-and-a-half-bath condo unit is on the market for $34.9 million and is also being listed by Elizabeth Sample and Brenda Powers of BHS. The third priciest new listing this week is a three-bedroom, three-bath condo at 100 11th Avenue, between 19th and 20th streets. The asking price for the 4,787-square-foot Chelsea home is $16.9 million and it is listed by Noble Black from the Corcoran Group. 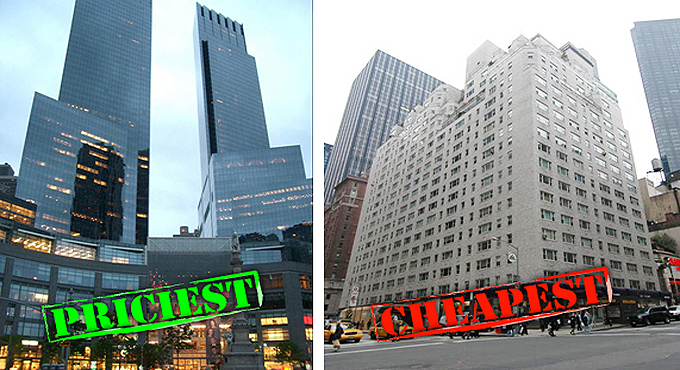 The cheapest Manhattan unit to become available this week is a one-bedroom, one-bath co-op at 100 West 57th Street, according to Streeteasy.com. The Midtown home has a $155,000 asking price and Joelle Pergolotti of Pergolotti Realty has the listing. The second least expensive home is an alcove studio at 301 East 63rd Street with an asking price of $160,000. The Upper East Side co-op unit is located in a doorman building and is being listed by Marcos Rada of Prudential Douglas Elliman. The third cheapest home to hit the market this week is at 14 Bogardus Place near Fort Tryon Park in Inwood/Washington Heights. The one-bedroom, one-bath apartment is being marketed by Matthew Bizzarro from Stein-Perry Realty, with an asking price of $219,000.